What the BBC did not want me to talk about! On Friday 26/2/10 BBC Radio WM predictably covered the very sad case of the death of Khyra Ishaq from Birmingham. After the twelve o’clock news the ‘Lunch with Ed Doolan’ programme featured an interview with Graham Badman, who needs no introduction to HE families. Ed Doolan asked him if the issue of home education was not a ‘red herring’ to distract attention from other failures, which Badman brushed aside. Ann Newstead from EO was interviewed next and she made very clear that the present Bill would not make any difference to this case. She also emphasised that if proper initial assessments by welfare services had been made by Social Services, as Mrs Justice King said in March in the High Court, “in all probability” Khyra Ishaq would not have died. I was then spoken to by someone from the studio who explained that they had received legal advice to the effect that they could not discuss the other children on air. I was angry because this meant they were not giving their listeners a balanced picture of what was already in the public domain. Instead they limited discussion to the one child and I cannot but ask if by doing so they were playing into the hands of the DfCSF and Birmingham City Council who want to abuse the memory of this girl even further. They are doing this by using the connection to home education to push through oppressive legislation in the case of the DfCSF, and to try and avoid taking the blame for departmental failures in the case of the local authority. I made it clear that I wished to make a formal complaint and I was phoned back later by someone from the production team. Predictably, it was unproductive because she was hiding behind the shield of legal advice. I pointed out that BBC News had made several references to the six children, both in the guilty plea by Angela Gordon to five counts of child cruelty and through references to them sleeping on a single mattress or eating from one bowl. She did of course have no real answer to this, simply saying that as a station they had been advised not to mention the other five children. Her attitude did change slightly when I said that I had no idea what the relationships of the children to each other or to the adults were. At that point she acknowledged that I seemed to be well informed. As an olive branch I offered to record an interview for them, which they could edit before broadcasting, but that was not in her brief, so it looks like I will have to go ahead and make an official complaint. Am I just moaning here or is there a purpose behind all this? The trial has demonstrated, and statements today from the police confirm, that home education was a factor in this case. It shows why we do need a system in place to make sure that when children are home educated or removed from school, they not only get a good education but are safe. That is why I asked Graham Badman to review home education and home educated children’s safety and welfare. I am now taking forward Graham Badman’s recommendations that every local authority should have access to any home educating family and that all home educating parents must register with the local authority. We will do all we can to ensure the safety of children, in Birmingham and elsewhere, including using statutory powers where it is right to do so. Did you spot the sleight of hand? “home education was a factor in this case”, but if you read these two paragraphs in full you get the take-home message that “home education was the factor in this case” which prevented the local authority from investigating and intervening in the home. However, the facts which are already in the public domain, even though the Serious Case Review has not reported yet, suggest that this is far from the case. By the time I phoned up the show many papers were carrying reports of the failure of local authority social workers to respond properly to repeated requests by two local schools to get involved. Suraj Ahmed, a doctor at Birmingham city hospital, examined a seven-year-old boy who lived at the house in January 2008 after teachers expressed concern about his welfare. “He was searching cupboards looking for food as soon as he got into school,” Ahmed said. “At lunchtime, he would grab food from other children’s plates and eat it, and that was a cause of concern for the school staff.” His weight was below average. Ahmed pointed out to Gordon that the child was not getting enough calories and suggested he saw a dietician, but she rejected this advice and said she did not want the school feeding him any snacks without her permission. During a brief stay in hospital, the boy would constantly approach people and ask them for food. A lock had been fitted high up on the kitchen doors to keep Khyra and the five other children in the house away from the food inside. This turns out to be only the tip of the problem. Since my contact with BBC Radio WM I have become aware of the judgement from a hearing in respect to an application by Birmingham City Council for a care order under section 31 of the Children Act 1989 in relation to the five surviving children. The application was made in the High Court (Family Division) Birmingham District Registry and judgement was given on 6th March 2009. It can be found here on the web site of the British and Irish Legal Information Institute. Warning to anyone who has not read it, the other 5 were all seriously malnourished (two within days of death and in a way that has mostly been seen in WWII POWs or African famines) and the social worker basically did not take into account the schools’ comments (over three months) about all the children (three with statements and one with an IEP) being obsessed with food and losing weight. In fact, to save this post from being incredibly long I have put a guide to the most relevant clauses in this 43 page document on a separate page. You can read it here (opens in new window/tab). 259. K’s death was caused by and is the responsibility of her mother and the Intervenor, but on the evidence before the court I can only conclude that in all probability had there been an adequate initial assessment and proper adherence by the educational welfare services to its guidance, K would not have died. Merely looking at the photographs of the house and the conditions in which the children were living confirms in my mind that had social services even seen the bedroom in which the children lived or the Mer [sp. manner] in which they were fed, they would undoubtedly have intervened. I am not sure how long Mrs Justice King’s judgement has been in the public domain, but until the Serious Case Review is published it is essential reading for anyone who wants to try to understand the events which led up to the death of this little girl. It paints a picture of a broken family descending into deeper and deeper problems. In the struggle to survive Angela Gordon, after Khyra’s father had left her, made mistakes and sought help from someone who had suffered in his own childhood. Signs of the downward spiral the household was in were spotted by both schools the children attended and they contacted Social Services several times to ask them to intervene. For whatever reasons, they were slow to do so and even when they did they handled the situation in a way which prompted the Judge’s comment in Para. 259 above. 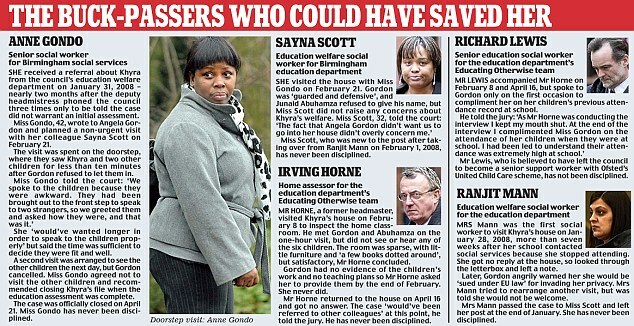 My concern here is not with what these people did or did not do, but with Ed Balls who as Secretary of State for Children, Schools and Families, should have been aware of this judgement some time ago. Even if he had not taken the time to read it in full, someone in his department should have briefed him as to its implications. If he was aware of this judgement and still chose to make the central issue of Khyra Ishaq’s premature death the fact that she was being ‘home educated’, then he is guilty of abusing this girl’s memory for political reasons. If he was not aware of the implications of this judgement before he issued his statement, then questions must be asked about his ability to run such an important Government department. I hope that the Serious Case Review will be published in full in this instance, because it is clearly in the public interest given the way the case has been dragged into the political arena. If, as Justice King’s ruling suggests it should, the SCR finds once again that local authority departments were not up to the job, then perhaps we should demand not only accountability from those in their employ, but also from the Department which is responsible for such services across the country. Of course it is the DfCSF’s political bosses who are ultimately responsible for what happens, but like Birmingham City Council they are all too ready to blame others. According to the Times Michael Gove has no gone on the record promising that the Conservatives would do away with Clause 26 should it claw its way through the present Parliament, should they form the next Government. This commitment is very welcome even though it has been a long time coming. It its also another good sign that should the Bill end up in the wash-up, Clause 26 will go down the plug hole. The Tories would scrap a new duty that requires parents who educate their children at home to be registered with councils. Michael Gove, the Shadow Schools Secretary, said that he would block plans which “stigmatise” home educators. Under the Children, Schools and Families Bill, which has almost finished going through Parliament, local authorities will setup databases of home-educating families and visit them to ensure that standards are met. Mr Gove promised that clauses of the Bill relating to home education would never become law if the Tories won power in the general election.